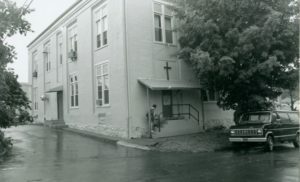 May 6, 1983 – Bethesda Mission “Women’s and Child Family Center” opens. In the early 1980s, Bethesda Mission decided to invest in a shelter for women. Until this time, when women and children showed up at Bethesda’s door, they were fed and given shelter at a local motel. Formerly Pleasantville Elementary School, the Women’s Shelter building was built in 1902. It was transformed in three months to a shelter that included plans for 40 beds and cribs. The months preceding the opening of this new endeavor were busy ones for the hundreds of volunteers who assisted the Director of Women’s Ministries, Cathy Overholser and her husband Harold, the maintenance supervisor for both shelters. Twelve women and children were welcomed on the first night the shelter was open.